The movie starts off with serial killer Charles Lee Ray (Brad Dourif) running from a cop (Chris Sarandon). He runs into a toy store and gets shot, and as he’s dying, he transfers his soul into a doll. We’re introduced to Karen Barclay (Catherine Hicks) and her 6-year old son Andy (Alex Vincent). She buys a Good Guy doll from a peddler and Chucky goes on a rampage. So this is where it first started. I remember when I first saw Child’s Play when I was a kid and it terrified me. It’s really one of those movies you need to see as a kid for full effect. If it was released today, I doubt people would really get it or find it scary but it’s still one of my favourite horror movies and it created one of the most memorable horror characters of all time. There are plenty of scares in the film. It starts off very suspenseful and mysterious and keeps you guessing. The story was written by Don Mancini who has written every Child’s Play film while the screenplay was written by him, director Tom Holland and John Lafia. I guess a lot of people would find the story silly. 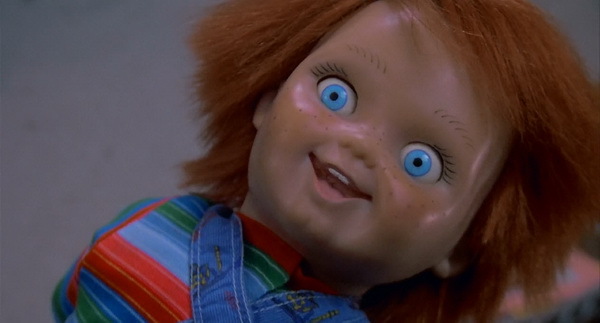 A doll coming to life and killing people sounds crazy but Child’s Play is one of the few movies where it’s done right. Voodoo is pretty much the central theme here explaining how Charles Lee Ray gets into the doll. The director Tom Holland (Fright Night) has done a great job at the start of the film. Whenever we see Chucky come alive, there’s subtle eye or head movements. Whenever we see him move, it’s from his point of view. The director never truly reveals him until midway through the film. And when it happens, wow… Brad Dourif is amazing as the voice of Chucky. We couldn’t have had a better actor to voice him. He puts his heart and soul into it. Especially when he laughs or screaming in pain. I doubt Child’s Play would have such a cult following had it not been for Dourif’s contribution. There are some amusing moments with Chucky. While it’s hard to take a killer doll seriously, the film isn’t over-saturated with humour, especially when you compare it to the later Chucky sequels. It’s supposed to be a straight up horror movie, and not a horror-comedy that the later sequels have become. The Chucky doll was created by special effects artist Kevin Yagher. 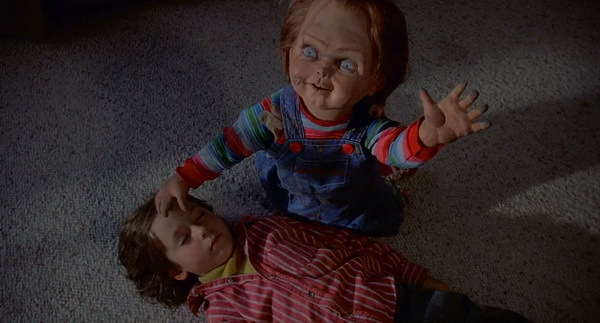 There has been plenty of killer doll movies prior to Child’s Play, but it was the movie where it all came together because of the great special effects. At the time, they were top notch and they still hold up fairly well today. Chucky is a combination of puppets, animatronics and a 4-year old running around in a Chucky costume. But this all works because of the great editing. It’s completely seamless. The animatronics can convey a whole range of emotions for Chucky. The design of the doll itself is fantastic. 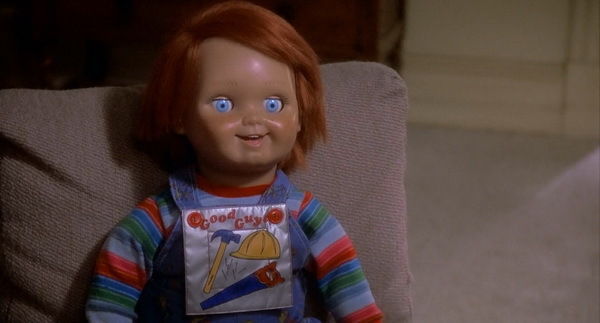 Just seeing him sitting there, Chucky just looks genuinely creepy even without the voice of Brad Dourif. The acting is generally quite believable, especially between Karen and her son Andy. He tried to convince her at the start of the film that Chucky is alive but she doesn’t believe him. He gets taken away from her and when she finally realises that it’s alive, she tries to find out more about him with the help of the cop. In order for us to believe that Chucky is alive, the cast have to sell it and they do. I’m sure it’s quite difficult pretending to be scared of a little doll but Catherine Hicks does a great job in the final scenes. After seeing the rest of the sequels, I do appreciate the first movie a lot more. It focussed more on horror and suspense rather than humour. I do kinda like the funny moments in the later sequels but I do miss the horror of the original. Hopefully one day, we’ll get a sequel that captures the original’s spirit. I’d recommend Child’s Play to anybody. If you can buy in to the premise of a killer doll coming to life, it’s quite a scary movie.